Top Tip Six: Always double check your equipment. 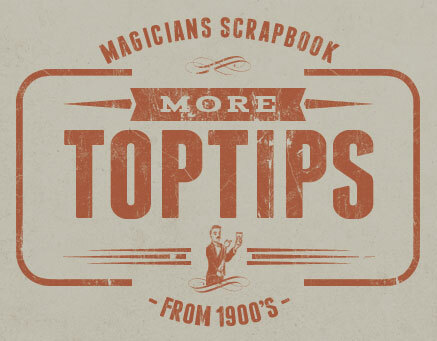 But Another Magician to Try the Feat! Within the last decade, a man familiar to the world as Chung Ling Soo, but known to his intimates as Bill Robinson, of Birmingham, met his death under circumstances which still provoke speculation among those who recall the tragic incident. 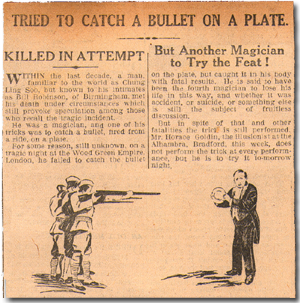 He was a magician, and one of his tricks was to catch a bullet, fired from a rifle, on a plate. For some tragic reason, still unknown, on a tragic night at the Wood Green Empire, London, he failed to catch the bullet on the plate, but caught it in his body with fatal result. He is said to have been the fourth magician to lose his life in this way, and whether it was accident, of suicide, of something else is still the subject of fruitless discussion. The theory that it was an accident is based on the known fact that Chung Ling Soo’s gun was very old and rusty. Top Tip Seven: When working with animals larger than a bunny, take care. Horse Bolts at Sight of Carmo’s Elephant. An exciting incident occurred in Low Street, Keighley, last night, shortly before 8 o’clock. A horse and milk float and an elephant were involved. 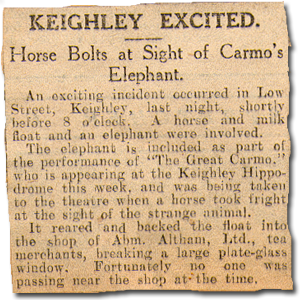 The elephant is included as part of the performance of “The Great Carmo” who is appearing at the Keighley Hippodrome this week, and was being taken to the theatre when a horse took fright at the sight of the strange animal. It reared and backed the float into the shop of Abm. Altham ltd., tea merchants, breaking a large plate-glass window. Fortunately no one was passing near the shop at the time. Top Tip Eight: When touring around the world, choose your transport carefully. MYSTERY MAN DUE IN LONDON. 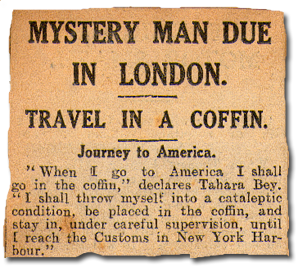 TRAVEL IN A COFFIN. TopTip Nine: Watch out for obsessive fans. 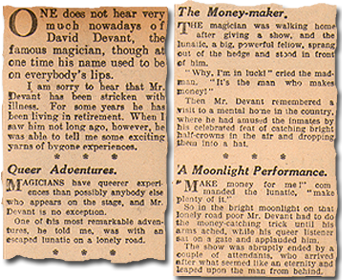 Magicians have queerer experiences than possibly anybody else who appears on the stage, and Mr Devant is no exception. One of the most remarkable adventures, he told me, was with an escaped lunatic on a lonely road. The Money-maker. The magician was walking home after giving a show, and the lunatic, a big, powerful fellow, sprang out of the hedge and stood in front of him. “Why, I’m in luck” cried the mad man, “it’s the man who makes money!”. Then Mr. Devant remembered a visit to a mental home in the country, where he ham amused the inmates by his celebrated feat of catching bright half-crowns in the air and dropping them into a hat. A Moonlight Performance – “Make money for me” commanded the lunatic, “make plenty of it.” So in the bright moonlight on that lonely road poor Mr. Devant had to do the money-catching trick until his arms ached, while the queer listener sat on a gate and applauded him. The show was abruptly ended by a couple of attendants, who arrived after what seemed an eternity and leaped on the man from behind. Top Tip Ten: Keep them guessing, even after your gone. HOUDINI’S WILL “Handcuff King’s” Secrets to be Destroyed. NEW YORK, Friday. 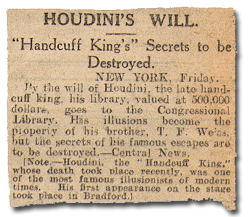 By the will of Houdini, the late handcuff king his library, valued at 500,000 dollars, goes to the Congressional Library. His illusions become the property of his brother T. F. Weiss, but the secrets of his famous escapes are to be destroyed.-Central News.